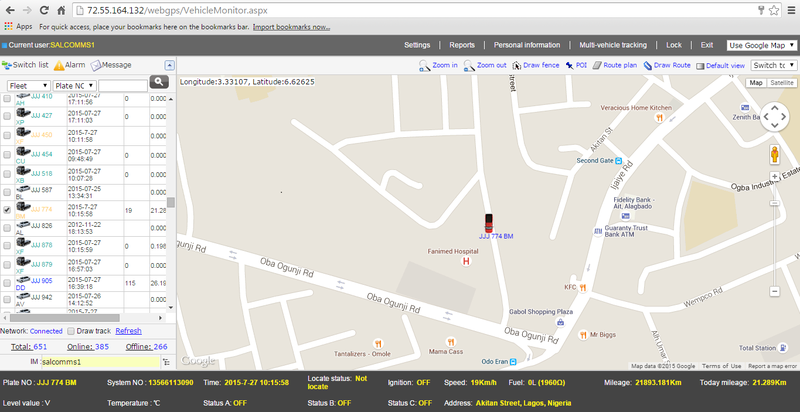 The Vehicle Tracking System (VTS) refers to the method in which the location of Vehicle is being determined, with it journey activities being recorded. It involves the usage of some software and devices which helps to present the location of the vehicle on an electronic map via the internet, which can be viewed using an internet enabled device. What is A Vehicle Tracker? service (VMS) provider. However, Salcommstrackers create an access login to customers to access these data for use in fleet management. The GPS (Global Positioning Satellite) technology employed by our comprehensive fleet management package combined with the dual-sim tracker provides the user with pinpoint accuracy in the monitoring of their fleet. Block B Suite 33, Primal Tex Plaza, Opp Iju garage, Pen-Cinema, Agege.